Surrounded by dramatic mountains and with stunning sea views, this 3 bedroom property is a true Kefalonian oasis. The villa has a large pool terrace and a choice of balconies and terraces from where you can enjoy the sunset over the sea. 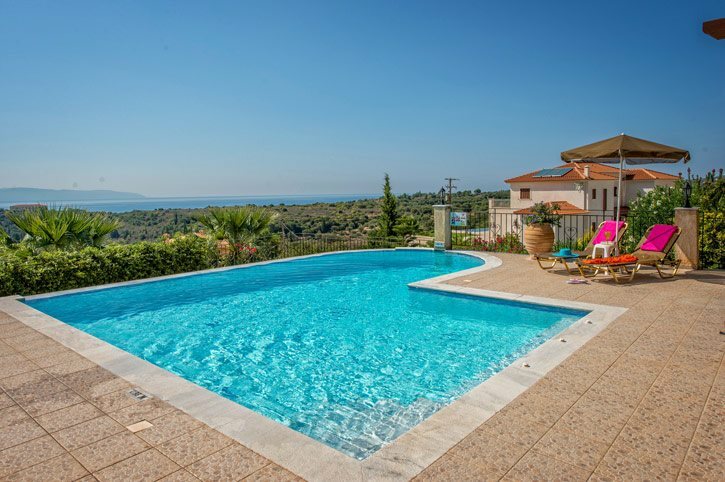 Set in a countryside location with a taverna across the road and a restaurant and mini market 5 minutes' walk away plus Trapezaki Beach is just a short drive, this villa has the best of both worlds. WiFi, air conditioning/heating in the bedrooms and pool heating is included. A lovely countryside villa with beautiful mountain and sea views. The private pool is surrounded by sun loungers on the spacious terrace. Kick-back and admire the mountain scenery and distant sea views while topping up your tan, or enjoy a good book in the comfortable, shaded seating area. 4 steps up from the pool terrace lead to a brick BBQ and alfresco dining area. There is shared driveway up to the villa with parking for your hire car . The front door opens into an open plan lounge, kitchen and dining area with comfortable seating, a TV and dining table and chairs . There are patio doors leading out to the terrace, keeping the interiors flooded with natural light. The kitchen is well equipped to cater for all your culinary needs. On the ground floor there is a generously sized twin bedroom with an en suite bathroom. The first floor is made up of a double bedroom with an en suite bathroom and twin bedroom with an en suite shower room. Patio doors open onto separate balconies from both these rooms with views over the countryside towards the sea . Just a few minutes' from Trapezaki, Villa Eos is in a countryside setting surrounded by beautiful flora. There is a taverna across the road and a restaurant and mini market 10 minutes' walk away so you'll be well catered for. The main resort of Trapezaki is within easy driving distance and has more bars , shops and restaurants. Trapezaki Beach and St Thomas Beach are close by, while the neighbouring resort of Lourdas can be reached within 10 minutes in a car. There is a mini market within easy walking distance from the villa, great for topping up on everyday essentials. Within a 10 minute drive you'll get to Lourdas Beach where there are a number of shops selling food and beachwear. Browse the fruit and vegetable stalls, bakeries and cake shops in Argostoli, 15 minutes' drive away. There are also some larger supermarkets on the outskirts of Argostoli. There are a handful of tavernas in Trapezaki and Lourdas. The nightlife in the area is very low key, but there are a few bars where you can enjoy a cocktail while watching the sun set. sun beds and parasols available for hire. St Thomas Beach is a few minutes' drive further away with a few beach bars on hand . A the foot of Mount Ainos, Lourdas Beach is a beautiful sand and shingle bay with beach bars and tavernas on hand providing refreshments throughout the day. Lots of the beaches in Kefalonia offer water sports activities including jet skiing, kayaking and inflatable doughnuts. Boat hire is a great way to explore Kefalonia's pristine coastline or even visit the neighbouring islands of Zante and Ithaka . If you're lucky you'll spot one of the Loggerhead Turtles on the way! There is plenty to explore in the area. The castle of St. George, the Mazarakata Tombs and the Monasteries of St. Andrew and St. Gerasimos are all less than 30 minutes' drive. The north of the island is well worth a visit with the harbour of Fiskardo, as well as Assos Castle and the sweeping bay of Myrtos. En-route stop at Karavomilos to explore the pleasant surroundings and lake. Trapezaki is a pleasantly uncrowded and uncommercial resort, very spread out amidst olive groves and countryside. It is ideal for those who like walking and exploring, and who are looking for more seclusion. Enjoy the coastal walk to Lourdas, a laid-back resort only 10 minutes' drive away. Villa Eos is not available to book for season as it is sold out. Take a look here at the Kefalonia villas that are currently on sale. This is the best villa we have had. The outside space was perfect with lots of sitting areas and shade from the sun. There was plenty of kitchenware unlike some villas we have stayed in. The villa was cleaned twice in the week by a lovely lady who did a great job. The rep was lovely and very professional . Lovely comfy beds, good bathrooms with plenty of hot water. We had a fantastic stay at this villa - thank you Villa Plus! I have travelled extensively and there is not a villa that I have stayed in that has provided such attention to detail - it was also spotless. I can't recommend Villa Eos highly enough - quite superb!